I always enjoy the prospect of a dinner out, especially when it’s sushi, Thai, Chinese, Vietnamese. Basically any Asian cuisine and you can count me in. And as much as I love to cook, I never feel as if the effort I put in to making a great Asian dish compares to the flavors I can get out. 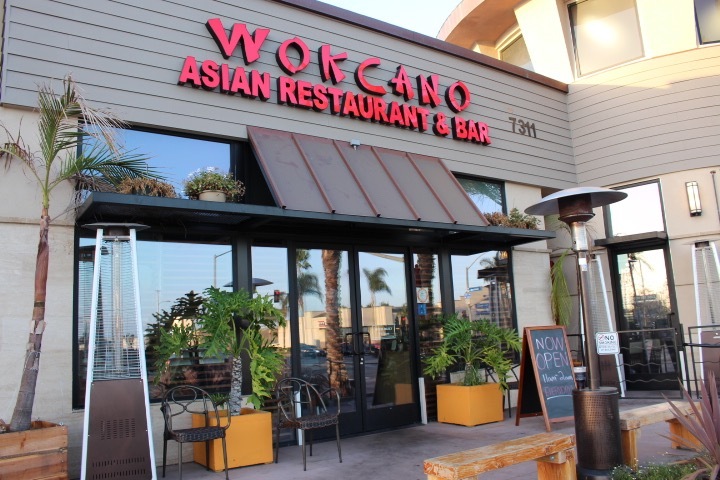 So I was happy to receive an invite to try the recently opened Wokcano in Huntington Beach. This small Southern California specializes in sushi, creative rolls, dumplings, and other Asian inspired dishes. I grabbed my partner in crime, Janice and to Huntington Beach we went. Based on the address, I was expecting Wokcano to be located at Bella Terra, the shopping area just off of the 405 at Edinger. It’s actually just a little past that in a quieter shopping area. The restaurant itself is open, airy and casually modern with a full open bar. We were seated and offered a cocktail to start. I decided on the Wokcano Pear, a refreshing combination of Grey Goose Pear, pear brandy and lychee purée served in a martini glass. Clean and light. So far so good. After a quick look at the menu, we decided on a good cross section of dishes to try, all very reasonably priced by the way. 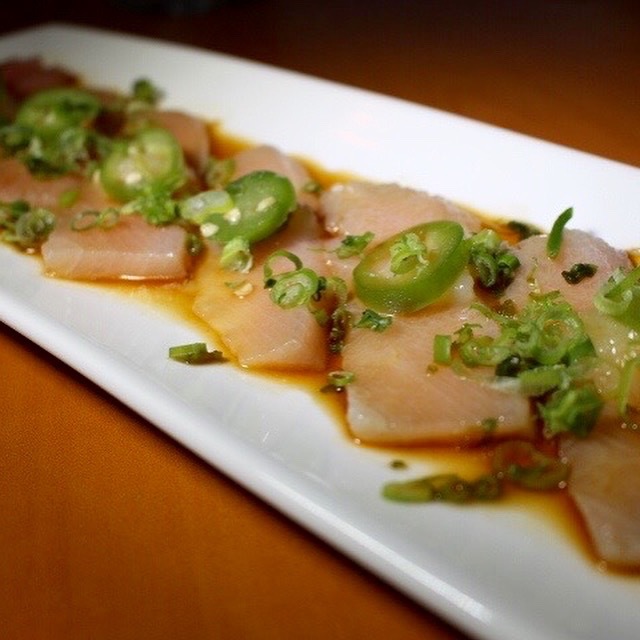 I always crave a sashimi style dish so we started with the Hamachi with yuzu with scallions, jalapeno and olive oil. With six pieces, it’s a nice start to a meal and perfect for sharing. 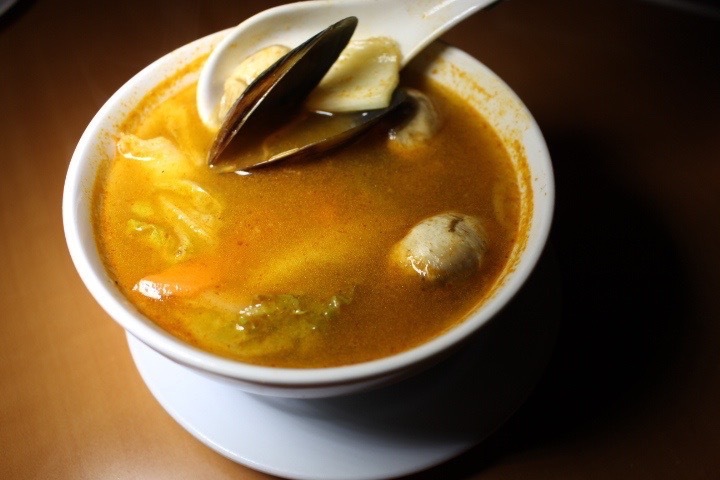 Next up was the Spicy Seafood Soup with fish fillet, green mussels and shrimp in a Thai style lemongrass broth. These types of soups are my favorite and so hard for me to replicate at home. The Hamachi and the soup would make a perfect small meal, but we did not stop there. 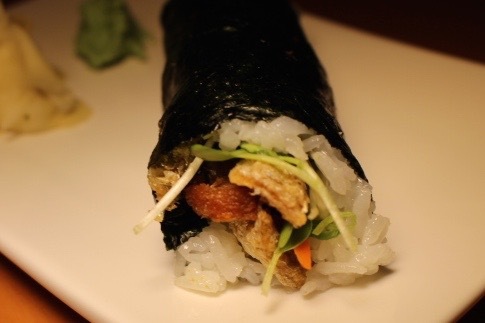 There is something about the salty crispness of salmon skin I adore so we ordered a salmon skin hand roll with avocado. Though it did not look like the cone shaped hand rolls I’m used to, this one was crispy and delicious. 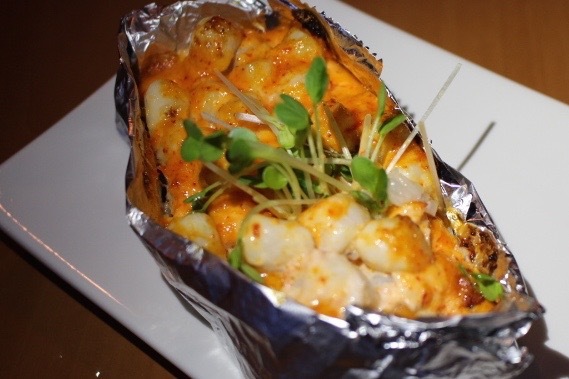 And as our shared “entrée”, we chose the Late Night Party Roll, an avocado and crab roll topped with baked lobster, scallops and scallions. Though not technically an entrée, it definitely can be considered one. So warm, rich and satisfying. 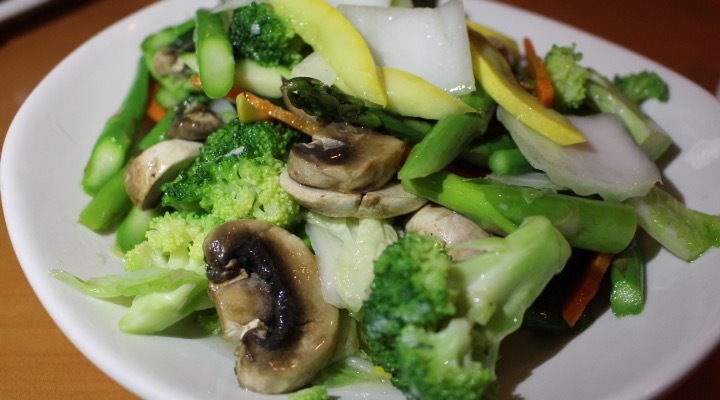 Finally, we rounded out with a couple of veggies. The aptly named Crispy Garlic Brussels Sprouts were some of my favorite Brussels sprouts I’ve had. 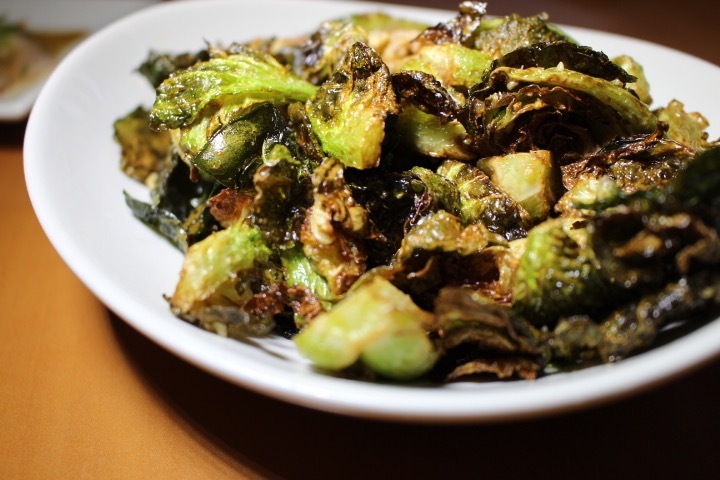 If you’re a Brussels sprouts fan, order these. And Janice wanted to try the Sautéed Fresh Mixed Vegetables. Not gonna lie, I was not excited, but… this mixture of zucchini, broccoli, Napa cabbage, mushrooms, asparagus, onions and garlic was crisp, fresh and so flavorful. I would definitely order this again. In a nutshell, this is one nice local restaurant with a good variety of Asian inspired food that will appeal to a wide variety of tastes.